"First published: November 2000. Reviewed March 2011." Jacqueline Jacob and Richard Miles2 1. This document is FACTSHEET PS-51, one of a series of the Department of Animal Sciences, Florida Cooperative Extension Service, Institute of Food and Agricultural Sciences, University of Florida. First published: November 2000. Reviewed March 2011. Please visit the EDIS website at http://edis.ifas.ufl.edu. 2. Jacqueline Jacob, poutlry extension coordinator, and Richard Miles, professor, Department of Animal Sciences, Institute of Food and Agricultural Sciences, University of Florida, 32611 Usually only chicken eggs are sold in general grocery stores. Some specialty stores, such as health food stores, may sell duck and/or quail eggs as well. Turkey and goose eggs are rarely sold for human consumption. Brown and white shelled eggs are available on the market. They are nutritionally the same. Since brown egg layers are slightly larger birds and require more feed, the price of brown eggs is generally higher than that of white eggs. Meeting consumer demands is a constant challenge for the animal food industry. Many consumers desire somewhat distinct products with respect to safety, healthfulness, freshness, taste, color, etc. To tap into this market, companies have developed several designer and speciality eggs which have appeared on store shelves. The nomenclature of such eggs may be confusing, and often misleading. The purpose of this factsheet is to discuss the types of "new" eggs currently on the market, their pros and cons, and some of the misconceptions held by consumers. One of the ways to market a new product is to change the old product. The contents of the chicken egg can be changed in such ways as to be more healthful and appealing to a segment of our consumers who are willing to pay for those changes in the egg. "Designer eggs" are those in which the content has been modified from the standard egg. Designer eggs have been produced that contain higher concentrations of several vitamins. 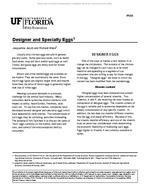 Two vitamins, A and E, are receiving the most interest as components of designer eggs. The vitamin content of the egg is variable and is somewhat dependent on the dietary concentration of any specific vitamin. In addition, the hen does not transfer different vitamins into the egg with equal efficiency. Because of this, the vitamin transfer efficiency and cost of the vitamin must be taken into consideraton when determining the economic feasibility of marketing such eggs. Eggs higher in Vitamin E are currently available in stores. Designer and Specialty Eggs 4 the sloping floor of the cage so that there is minimal contact between the egg and the hen. This decreases the possibility of bacterial contamination of the egg. With regard to the welfare of the laying hens, cages have both advantages and disadvantages. While the issue of cages and animal welfare is still being debated, there are some consumers who prefer to purchase eggs produced from hens that are not kept in cages. In order to meet this niche market, some producers raise their birds in a "cage-free" or "free-roaming" system. It is important to note that "cage-free" does not mean that the birds are raised outdoors. Typically the birds are maintained on the floor of a poultry house. The higher production costs associated with this type of management system are reflected in the higher price for the eggs. The price of "cage-free" eggs is often twice that of regular eggs. Often the packaging of "cage-free" eggs can mislead the consumer about the product they are purchasing. It is common to see designs on the egg cartons including chickens roaming free outdoors. This is not the case with "cage-free" eggs. The hens are still maintained indoors, just not in cages. "Free-range" eggs are produced from hens that are allowed to graze or roam outdoors. It is not necessary, however, for the hens to be outdoors all the time. Typically, the hens are housed in a poultry house that has access to the outdoors. The hens have the ability to go outdoors during the day, although they can also choose to stay indoors. The flock is usually locked indoors at night to protect the hens from predators. There is no set standard on how much range must be available for the hens. Pasture rearing of chickens is a modification of the free-range system. The birds remain on pasture all the time, but are confined within a portable pen. The pen is moved daily to give the birds access to fresh pasture. The portable pen usually has a portion covered to protect the hens from the elements. Until recently there was no set standard for the production of organic poultry products. The USDA is currently working on developing legal standards. Many states, including Florida, have set standards for organic produce.To be certified organic, the eggs must be produced from hens that have been fed certified-organic feed which was produced without synthetic pesticides or herbicides, antibiotics, or genetically-modified crops. In addition, no synthetic pesticides can be used to control external and internal parasites. Typically, organic eggs are also produced from hens in cage-free systems. Almost all eggs produced commercially are infertile. Roosters do not have to be present for hens to lay eggs and roosters are, therefore, not kept with laying flocks. When there is an excess of hatching eggs in the poultry meat industry, eggs from broiler breeder flocks can be sold for human consumption. A large percentage of these eggs will be fertile. Fertilized eggs are safe to eat. There is no nutritional difference between fertilized and unfertilized eggs. The embryo does not develop in fertilized eggs that are refrigerated soon after laying. Additional Notes: 3. Perilla (Perilla frutescens), a member of the family Labiatae, is an annual herbaceous plant native to Asia. It is also known as the Asian Beefsteak plant. The leaves are used as spice and in pickled food in Japan, however it is cultivated as a foliage plant in foreign countries. Perilla herb oil is a natural spice with many uses. It is a pure plant extract, and contains no animal oils. Omega-3 fatty acids is the important ingredient of perilla oil. 4. Chia is a common name often used for several Salvia species. It is a member of the Mint (Labiatae) Family. For centuries Chia was of great economic importance to Native Americans of the Southwest and California coast. The parched seeds of the Chia were ground to make the staple flour, pinole. Indians also placed the seeds in water to make mucilaginous poultices and beverages. An infusion of the seeds was valued by Spanish Missionaries as a fever remedy and as a poultice for gunshot wounds.